Home Depot Has Bought Back $2.4 Billion of Stock in 2016 -- Should Investors Be Happy? A look at how the home improvement retailer's share repurchases have paid off for investors. Home Depot's (NYSE:HD) capital spending plans call for shelling out $10 billion this year -- with half of that figure going toward share repurchases. In fact, buyback spending is far greater than what the retailer directs toward investments into the business. It's also significantly above Home Depot's dividend payout. Overall, management is right on pace with its repurchase goal, having spent just under $2.5 billion through the first six months of the current fiscal year. By comparison, it expects to shell out just $3.4 billion for dividends in 2016 and about $2 billion on growth initiatives like boosting its e-commerce infrastructure. Home Depot's 2016 capital spending plans. Data source: Financial filings. Those figures make it seem as though the company could be spending too much on repurchases, relative to its other operating and financial priorities. However, the outlay fits right into management's long-term plans, and is poised to increase significantly in the coming years. Home Depot generated $4.2 billion in net earnings through the first six months of fiscal 2016, while operating cash flow was $6.9 billion. Those figures are both up substantially from just $3.8 billion and $5.9 billion, respectively, in the same period last year. That growing cash flow is one of the biggest benefits of the retailer's long track record of market-beating growth. Management's first priority when allocating those sums is to invest in the business, which it is doing by spending heavily in two key areas: building out an e-commerce infrastructure and tightening its grasp on the professional side of the home-improvement market. Yet because it isn't expanding its store base, Home Depot tends to have plenty of excess funds even after meeting its main business objectives. That's a key reason why it can afford to promise 50% of its earnings to shareholders as dividends. In that context, Home Depot's stock repurchase spending seems appropriate since it doesn't get in the way of either business investments or a substantial dividend commitment. Investors also have to be happy about the fact that the buybacks have significantly boosted their ownership stakes in the business. 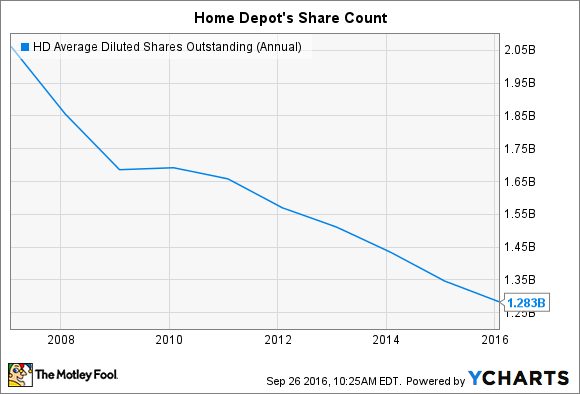 Home Depot's outstanding share count is down nearly 40% over the last 10 years. While capital spending and dividend payments are closely tied to earnings, Home Depot has no problem relying on debt to goose its stock buyback plans. Last year, it issued about $4 billion of debt, which it used to help fund $7 billion of share repurchases. Executives seem open to making a similar move in the coming quarters. For one, interest rates remain at historically low levels, especially for a blue-chip with Home Depot's strong balance sheet. Second, Home Depot's debt-to-earnings ratio has drifted below the target that management has set out. That reduced leverage translates into more ammunition that the retailer can use to make bold acquisitions like its recent purchase of Interline Brands. However, the company has decided that a certain level of debt is ideal, and it isn't interested in straying too far from that number. "It is not our intent to let that borrowing capacity continue to grow, and as we have in the past, we've opportunistically taken advantage of interest rates and availability to raise incremental debt and increase our share repurchase," Chief Financial Officer Carol Tome told investors in a conference call in August. She further explained, "So you should think about our past practice as something that we should continue in the future." So while management isn't forecasting a new dip into the credit markets soon, Home Depot has signaled it is growing more open to the idea. Shareholders should look forward to a move like that as it's more evidence of good stewardship of their capital.